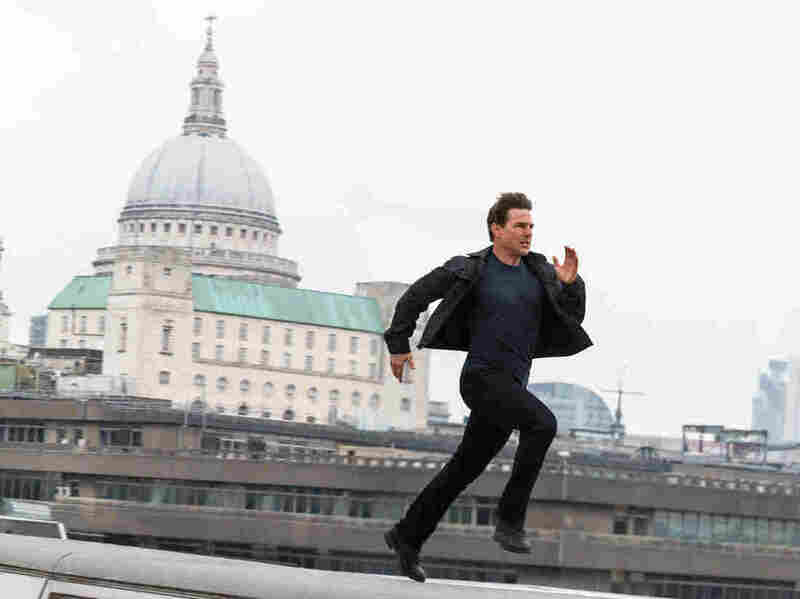 Spectacular Real-World Stunts Make 'Mission: Impossible - Fallout' A Blast Writer-director Christopher McQuarrie returns to the M:I franchise with jaw-dropping stunts and set pieces, ensuring that "Fallout's sky-high thrill quotient obliterates that of all competitors." In the opening moments of the 2.5-hour Mission: Impossible — Fallout, producer/stuntman/star Tom Cruise's Ethan Hunt shares a tender moment with Julia Meade-Hunt (Michelle Monaghan), the woman for whom he tried to retire from the impossible mission business 12 years and three movies ago, and who's rated only a silent cameo since. Our Man Hunt's reverie is swiftly ended with the arrival of yet another soon-to-self-destruct assignment. This one comes in a hollowed-out book concealing an antique reel-to-reel tape recorder. Digital animation will almost certainly advance to a point where it becomes indistinguishable from photography of physical performance in the physical world — or in the case of the grandest of Fallout's half-dozen Olympian set pieces, 25,000 feet above the Earth. (This high-altitude, low-opening parachute dive into Paris is easily the most vertiginous movie stunt ever, requiring more than 100 twilight dives to capture.) When that day comes, we'll have bigger problems than that our popcorn movies will be less exciting. But it's not here yet, and the way Fallout's sky-high thrill quotient obliterates that of all competitors makes you grateful that action cinema is still something of a meritocracy. There are viewers to whom it will not matter that Cruise — who turned 55 while Fallout was shooting — did his own motorcycle racing and building-leaping (you can see him shatter his ankle for real in this movie, you sicko) and HALO jumping and helicopter flying (!!!). Look, I am not especially troubled that Marni Nixon overdubbed Audrey Hepburn's singing in My Fair Lady. (Nixon should've been credited, though.) It's certainly odd that a three-time Academy-Award-nominee who's worked with the likes of Martin Scorsese and Francis Ford Coppola and Oliver Stone and Stanley Kubrick and Paul Thomas Anderson waited until his mid-40s to become virtually a full-time DIY action star, as much athlete as an actor. But to dismiss his seeming death wish is to undervalue a Buster Keaton/Gene Kelly/Jackie Chan-level entertainer. Who cares if we no longer buy him as an ordinary human being? We've got plenty of those. This series, which began in 1996 with a Brian De Palma-directed entry that more resembled the paranoid thrillers of the 1970s than it did contemporaneous blockbusters like Twister and Independence Day, has always relied at least as much on Cruise's taste as a producer and cinephile as on his star power. Once audiences began to signal that weren't interested in him as a romantic lead, Cruise responded by quietly accepting this verdict and then tapping Brad Bird, who'd never made a live action film, to renew the series with 2011's Ghost Protocol. That became the new template for the series, bringing a new commitment to verisimilitude and spectacle — Cruise's shot-in-IMAX outdoor walkabout to the 130th floor of the Burj Khalifa stands as one of the all-time great movie stunts — and a greater emphasis on the rotating co-stars, particularly Simon Pegg's IT-guy-turned-field agent Benji Dunn. Late-period Cruise does the opposite of what most actors do: He outsources the "relatability" skillset but handles the life-threatening stuff himself. Fallout is the dizzy culmination of all that. In venerable spy franchise terms, it's the movie Spectre wanted to be: A direct follow-up in a series more known for one-and-dones, and a self-aware legacy-quel that tips its hat to the past while trying to enrich its oft-inscrutable hero's inner life. Frankly, I always liked that Ethan Hunt was something of a unknowable zealot, defined only by pursuit. (The only lasting benefit John Woo's M:I-2 brought to the franchise was showing us that this nut's idea of a vacation was to climb a mountain sans rope.) I was never going to care about his marriage the way I want the rocky partnership of John McClane and Holly Gennaro to work out. The latter installments showed Hunt increasingly succumbing to the sort of bug-eyed mania audiences had begun to ascribe to Cruise in real life, and to approach his feats of derring-do with more trepidation than cockiness. These tweaks improved the films substantially. Christopher McQuarrie, the first director to return for a second Mission, has grown as a visual storyteller since he made the terrific Rogue Nation, but he's still a writer first, the guy who won an Oscar for the screenplay of The Usual Suspects, and who made uncredited rewrites on Ghost Protocol and Edge of Tomorrow, both first-rate Cruises. Even when all he's doing is stitching the set pieces together into a occasionally befuddling web of counter-betrayals and mask-reveals, he's adding value. I wish he could've cut down the Cruiseplaining just a little, but maybe that's the cost of doing business. The setup this time is that Hunt's squad lets three plutonium cores fall into the hands of black marketeers, who also want to secure the release of the terrorist mastermind I keep wanting to call Nathan Lane. (His name is Solomon Lane.) He's the guy the IMF trapped in a box at the end of Rogue Nation. He's played by Sean Harris, who looks like a hybrid of Cruise and Pegg, a resemblance Fallout occasionally uses to its advantage. Even better, Rebecca Ferguson has returned for M:I-6 as MI6 Agent Ilsa Faust. She lives up to her name. This most intimate of the film's many set pieces shows us in miniature what the Mission series possesses that others do not. There's world-class fight choreography, sure, and topnotch physical performances from Cruise and Cavill and, in that epic bathroom dust-up, Liang Yang. But, between them, there are rests. There are changes in tempo. There are opportunities for the audience to catch its breath before the action resumes. McQuarrie never forgets the stakes. Mission: Impossible has become the blue-chip action franchise of the 21st century. Choose to accept it.